Organinze with this system to improve inventory control. 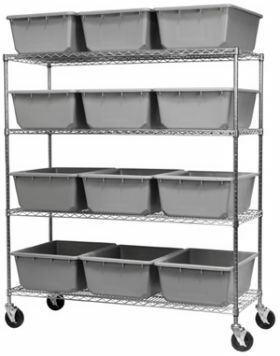 Ideal for assembly cells, warehouses, stockrooms, and more. Available with 4 or 7 shelves. Configure for 12 or 24 Akro-TubsÂ® . Akro-TubsÂ® feature extra thick walls for strength. Rolled rims provide comfortable handles for lifting and moving. Tubs are Gray in color. FOB Shipping Point. * Sort parts to increase efficiency. * Reduce dust and dirt build-up on parts. L x W x H Shelf Dims. D x L x H No. of Shelves No. of Tubs Bin No. Wt. (lbs.) Price Ea.